Awkward! 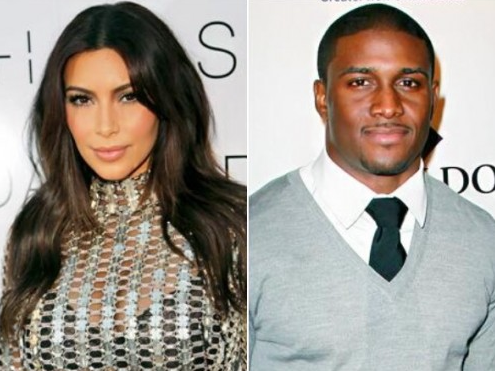 Kim Kardashian runs into her ex- Reggie Bush and his fiance' Lilit Avagyan. She may want to try a juice bar next time! Kim Kardashian started off her day with quite the uncomfortable run-in on Monday, March 17. While stepping out in West Hollywood to grab some grub, the Keeping Up With the Kardashians star bumped into her ex Reggie Bush and Lilit Avagyan, his fiancee and baby mama, a source tells Us Weekly exclusively. Kardashian, 33, dropped by Bel Bambini to do some shopping, but first stopped into Ed's Coffee Shop to order an omelette, the insider tells Us. But when she walked into the small restaurant, she noticed the NFL player and 26-year-old dancer Avagyan. A source says, "It seemed uncomfortable." "Kim ordered her omelette, then went to Bel Bambini," the source tells Us. Kardashian famously dated Bush, 29, on-and-off for two years before splitting for good in July 2009. The two reconnected, however, after Kardashian's failed 72-day marriage to Kris Humphries in February 2012. "Reggie and Kim have been talking since she split with Kris," an insider told Us at the time. He'd been "comforting" her, the source added. Kardashian has since moved on with rapper Kanye West, 36, and the two are set to say "I do" in Paris, France on May 24. They welcomed baby girl North West in June 2013. Bush and Avagyan, meanwhile, got engaged and welcomed a little girl of their own one month earlier. In moments of solitude, I'm sure she laments the one that got away.